Want to get up and running fast? ONTRAPORT's Client Success team members onboard and migrate new users to ONTRAPORT from other systems all day long. For the first 90 days, each new ONTRAPORT customer is eligible for time with our team where they work inside your account to get all your automation essentials set up FOR you. Whether you're an automation expert or a relative newbie, these onboarding are invaluable! To schedule your onboarding calls, contact our Support team at support@ontraport.com. Our Introduction to ONTRAPORT Video Series are a good place to start. Hosted by our CEO Landon Ray, the series provides a great overview of the concepts and tools available, as well as the best practices to leverage the power of ONTRAPORT for your success. The following sections provide the step-by-step "how to" knowledge to get up and running fast! We ensure that our app is compatible with Google Chrome and Mozilla Firefox. Please use one of these browsers when working inside your ONTRAPORT account. Using other browsers (e.g. Safari or Internet Explorer) may cause compatibility issues including latency and visual differences. Visit ONTRAPORT.com and click the login link to enter your username and password. You may also bookmark app.ontraport.com. If you lose your password, click the login link at ONTRAPORT.com and click the "I forgot my password" link at the bottom of the login screen. Enter your email address on file and a reset link will be sent. About This Page is a context sensitive help feature that provides a description of the current page or section plus training videos, FAQs, and links to related support material. The first time you visit a new section of ONTRAPORT with About This Page available the information will appear on the screen. The About This Page information can be "popped out" into a separate window by clicking the "↗" icon at the top right, allowing full interaction with ONTRAPORT while you review the information. Sections can be expanded by clicking the "↕ More" icon. Closing the About This Page information using the standard window "X" icon collapses the page for recall later. You can also toggle the information off and on screen by clicking the About This Page icon at the bottom right. When closed, the About This Page icon at the bottom right is active to recall the information. The following sections cover the most popular topics. ONTRAPORT has a ton of resources to help you grow and scale your business! ONTRAPORT Academy: Gain software training, marketing tactics, leadership strategies and operational know-how here. Guides: Downloadable guides complete with data-driven insights and the latest strategies and tactics to support your business growth. Blueprints: Learn everything you need to know to develop and implement core marketing and sales strategies in your growing business. Usecases: Specific examples with video tutorials on how you can use ONTRAPORT to implement marketing and sales strategies to take your business to the next level. In-App: Support: Click the "?" icon in the bottom right corner of your ONTRAPORT account to contact support by chat or email, use the Quick Start Checklist or Step by Step guides for for common tasks, or read our knowledge base docs and much more. Knowledge Base: Full system documentation about every ONTRAPORT feature. Plus Q&A's moderated by the ONTRAPORT team. Online Software Training Bootcamp: Step-by-step software education to help you learn about basic ONTRAPORT features. Email Deliverability Traffic School:Deep dive into the facts behind email delivery. Workshops: Marketing strategy and automation tips to help streamline and grow your business. ONTRApalooza Talks: Select talks from our annual event about marketing, publishing, sales and organizational strategies. ONTRAPORT customers receive a username (usually the one you log into your ONTRAPORT account with) and password when they sign up for an ONTRAPORT account. If you lost your password, click here. If you'd like to sign up for ONTRAPORT Academy, go here. Having trouble? Check out our Contact Management FAQs and Usecases. The Automation section describes the power at the heart of ONTRAPORT, with automation tools for your contacts such as drip marketing campaigns, auto-responders, automated product fulfillment and tasks. Now that you have this automated system lets start building your list! At its core your list is built two ways, by import and from opt ins. 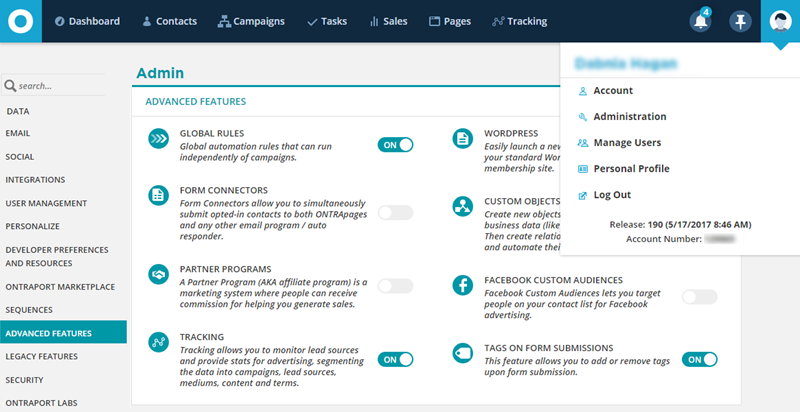 This section of the setup guide is dedicated to showing you how to build an opt in ONTRAform or Smartform, tie it to an automated Campaign, and post it online to a squeeze page and/or your website. Add action and wait elements below the Trigger element to automatically communicate over time. Personalize your reporting dashboard to track your opt ins. One of the best parts of your ONTRAPORT account is that it is an all in one solution. You can create an order form to sell products, set up fulfillment and run engagement automations all from the same system. Use this guide if you have never set up a product in ONTRAPORT. If you are staying with an external shopping cart and want integration documentation we have that here. Publish your Page, add it to your WordPress site or add an ONTRAform to your website. If you have payment plans or recurring subscription payments, Setup Your Collections Settings. Test your sales process using a Dummy Gateway. Integrate your WordPress website with PilotPress.